For some reason, I became enamored with train travel at a very early age. One of my earliest memories is of riding the Strasburg Railroad, an antique steam engine train in southeastern Pennsylvania, with my grandparents. I returned to daycare after my first trip to Washington, DC, recounting only the experience of riding the metro, including pitch-perfect recitation of, “Doors closing <ding dong>.” As I grew older, rail transit became a fundamental element of how I interacted with the world. Trains have meant never needing to brave the commuter traffic of Washington or New York metro areas, arriving safely at my destination after enjoying a few chapters of a book. While living in Japan, trains literally carried me anywhere I wanted to go, and the micro-worlds found above, below and around major hubs packed enough activity to merit their own anthropological study. It was these thoughts that came to mind when I first heard mentions of the stimulus funding that had been marked for investment in US rail infrastructure. It was disappointing to watch how quickly the public discussion devolved into debate over whether we ought to be spending any money for this at all. Some politicians equated investment in public transportation with socialism and found that adopting an anti-train platform could help one garner a respectable amount of votes. What makes this all a bit absurd is that, with population growth projections of over 100 million in the next several decades, the choice between investing and not is a false one. Even more ridiculous, the much maligned stimulus funds merely propose to bring many existing and decrepit transit systems up to something resembling working order, and the so-called high speed rail plans are mere shadows compared to what already exists or is being built in Europe, Japan and China. The ship is sinking and we are arguing about whether to plug the hole. I grew up watching my father leave for work around 5:30 in the morning, a 90 minute car commute (each way). My father loves life as much as anyone else, so I often wonder what he might have done with an extra three hours a day. I have worked in Philadelphia, Washington, DC and New York, but for my entire career have never commuted by auto. Choosing to live and work in urban environments with mass transit, taking me out of the driver’s seat, was a conscious choice to ensure that I can always make productive use of my time. I have polished off many a good book on my way to and from work. For a time, I was living in New Jersey but working in Washington four days a week. I took Amtrak down the Northeast Corridor early Monday morning and back Thursday evening. I usually departed on the trip down around 6:00am, making use of the quiet car to rest before jumping head first into the day when I arrived at Union Station. On the return trip, I could finish work, pull out a book, and in some cases even make a new friend. Though we grumbled about Amtrak’s less than stellar on-time statistics, in truth no one was sorry to have avoided a grueling trek up or down Interstate 95. Hong Kong has a convenient and well-maintained metro system. 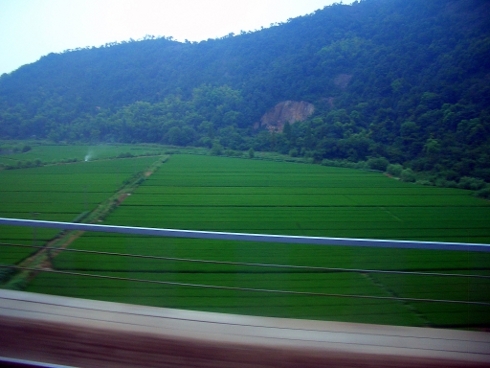 It can take you all the way from Hong Kong Island to the border with Guangdong Province. Though not quite as fast, the brightly colored tram pictured above is another way to get around the central business district. For 2 HKD (about $0.25) you can take in the changing scenery, hang your arm out in the harbor breeze, and get up close and personal with the local inhabitants while en route to your destination. China is investing in rail infrastructure as if its future depended on it (which it very well may, as anyone who has sat through a Beijing traffic jam can attest). It is building a high speed rail network comparable to Europe and Japan’s, as well as extensive regional rail (much of which still runs faster than Amtrak’s Acela), local services and metro systems. For my wife Min and I, this means that the 350km trip from Shanghai to Jinhua to visit our parents, four and a half hours at highway speeds, can be made in about two while comfortably zipping across the countryside and enjoying tea brewed by aid of the onboard hot water dispenser. Japan’s Shinkansen trains whisk passengers between major cities at speeds of up to 300 km/h, stopping in central city transportation hubs with seamless connection to regional rail and metros. Their cost competitiveness and convenience (no security lines or baggage check) has led to the elimination of some short and medium haul flights. One could finish work in Osaka, hop on the Tokaido Shinkansen and be back in Tokyo (550 km away) in time for dinner. Despite the distances involved, Japanese from different regions can jump from city to city almost as effortlessly as data moving between nodes on a computer network. 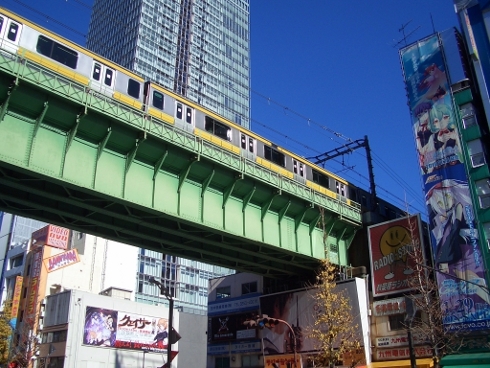 In Tokyo, as in other large cities, extensive rail and metro networks have a profound impact on the rhythm of Japanese life. Stations often serve as focal points for neighborhoods. They are one of the most common locations for meeting others. Large department stores and grocery halls built into hub stations are always buzzing with activity as commuters stop to pick up items on the way home (I did my weekly grocery run at Odakyu’s food hall under Shibuya Station). 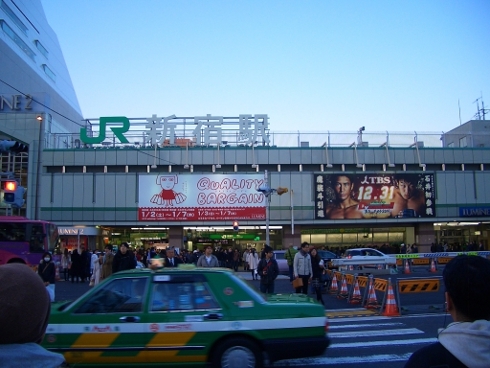 Shinjuku Station, the Guinness world record holder for most passenger volume, has enough restaurants, vendors and services that one could survive a lifetime without leaving the complex. 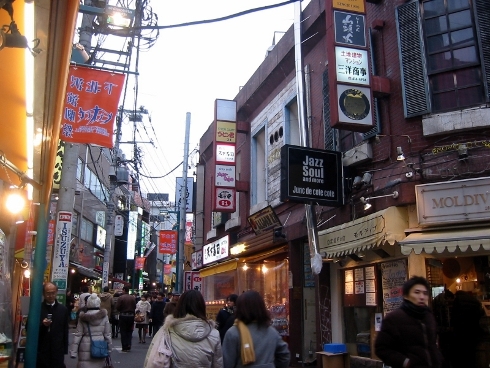 The Shimokitazawa neighborhood in Tokyo’s Setagaya Ward is defined by the fact that it surrounds its train station of the same name. The tiny apartments and shops on narrow streets and allies crammed into the spaces between the intersecting Odakyu and Keio Inokashira lines create its characteristic charm. For many in the US, it might be challenging to understand how this could be desirable, but the residents of Shimokita wouldn’t have it any other way. In some ways I think travel by train helps us to remember that we are part of something bigger. 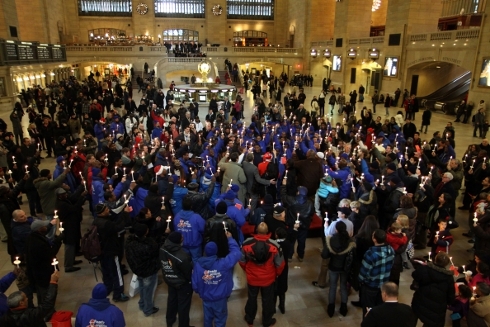 New York’s Grand Central Terminal has more platforms than any other train station in the world, dispatching riders to destinations throughout New York State and Connecticut. The Main Concourse is typically awash with travelers headed to meetings with colleagues, friends and family. It vibrates with unmistakable energy confirming that life happens here. Yes, we are not Europe, Japan or China. There are difficult barriers we face. We have so much existing non-compact development, which makes rail impractical for some areas. Highway travel and petrol are not priced to reflect their true costs, which distort financial viability projections for public transit projects. Both of these contribute to a way of thinking that equates car ownership with personal freedom, but more cars and more highways are not scalable. We should not build trains (or other infrastructure) to nowhere, but where and when we must build there is a great opportunity to rethink how we as a society wish to cultivate our way of life. I hope that by calling more attention to these additional benefits we can reframe the discussion away from incremental changes to the status quo. Doors are opening <ding dong>. Remember the trips into Philly via PATCO? Yep. I also remember the ticket didn’t cost quite as much as now! Same thing here in Vancouver. Agreed. Trains are incredibly cool. And there’s just something about the smell of a (clean) train station … smells like adventure! No doubt! In the big hub stations in Japan, you can have quite an adventure before you even get out of the station (or on the train). Great. I would love to hear what you think about it. I heard that it has been having some technical trouble that operators are trying to correct. I went on that last week. It is a pretty fantastic experience, 10 times better than flying. If they do have technical issues they are not affecting the service, scheduled time for the journey is 4hours 40 minutes and it was perfectly on time both ways. They have decided to run the trains at 300kph instead of the planned 350. There are some allegations that the concrete foundations are not of sufficient quality, they are also trying to keep operating costs down and consequently ticket prices, as there are some complaints that the prices are too high for the majority of people in China. I think the best thing about it is that they managed to open it about 8 months ahead of schedule. Good to hear the bugs are being worked out! Yes, I’ve read about the fly ash problems, as well as the issues around whether average people can really take advantage of HSR, given the price. While I want these projects to do well, I keep one ear open to skeptics and realists. I agree with you on the comfort. I rarely can sleep on planes, but I passed out shortly after leaving Osaka and woke up in Tokyo. Interesting project, trying to get a bead on train culture. Have you seen the movie Spirited Away? There is a wonderfully evocative scene of riding a train near the end. Thanks! I’m trying to get a bead on efficient lifestyles and smartly designed communities, more broadly. Trains/transit play a significant role in that. Yep, I have seen Spirited Away. Miyazaki incorporates transportation and environmentalism into many of his works. Right now I’m taking a look at Nausicaa (manga and the film). Great post. Now I will have train brain the rest of the day. Thanks! I hope train brain is a good thing. The situation is even more desperate in Canada. The problem is one of population density– New York, China, Japan, Europe, all have a dense enough population to support a decent rail service. That’s not just a case of a collective “This traffic is stupid, I’m taking the train” sensibility being forced upon people (although that’s present), but having the absolute number of riders being sufficient to support the cost of running the lines. This is not to say I’m against trains; love ’em, wish there were more of ’em. You’re right on with the density issue. You can’t support infrastructure like that without a user base. Even further, I think small space forces development to happen in certain ways and inhabitants to adopt certain habits. It’s definitely not all out of altruism or concern for the environment. In a place like Japan, the inclination toward, say, getting a car is still there. There just isn’t enough room for people to park them! While providing trains in much of Canada is expensive, it is not impossible. And since most of us live in urban areas there is actually quite a lot that can be achieved. The problem that we and the US share is the dominance of the automobile industry and its huge support structure – and the way that those corporations have the ear of government at all levels. When we do trains well – and we do – we have no problem filling them. That’s true of The Canada Line in Vancouver, GO Trains in Ontario – and especially the Rocky Mountaineer, one of the mosts expensive and popular train rides in the world. We have plenty of pockets of density that support trains. Calgary and Edmonton are both expanding their light rail rapid transit systems and they are about as oil dependent as any place on earth. We can do much better, no doubt about it. But the problem is political will not lack of population. We may have one of the nation’s prettiest commutes, along the Hudson River to NYC with the Palisades opposite. I’ve often gone from NY to Toronto by train (12 hours) and went across the country from Chicago to Seattle then back to NY by train. But, as you write, the U.S. still doesn’t have anything near the infrastructure or funding for things Europeans and Asians take for granted, like TGVs and bullet trains. Which is a shame. Nothing like a great train trip! Absolutely. A plane may get you there faster, but it’s tough to enjoy the scenery at 30,000 ft in the air. When I was younger, my brother and I would sit on a hill at my grandmother’s house and watch the trains go by. I love trains (minus the noise). One of the biggest motivations about my upcoming plans next year to travel to Japan is experiencing their train/rail transportation system. Growing up in California has had me in a nice little personal transport ‘bubble’. The most experience I’ve ever had was the small train system that links some of the hotels together, and some of the Metro lines in L.A. And you know what? I have lots of fun every time. It’s like I’m in a different country! That’s great! Where will you go in Japan? Hope you can share your impressions once you’re there. The train system in Japan is amazing. Trainspotting is a major pastime right throughout the country. I have experienced the full local city trains at peak hour where there are people to push you in the doors. You do not need to hold on to anything and you may find that you are forced off at a station that you don’t want, finding yourself rushing back on when the crowd disperses a bit. Do you know anything about the new monorail in Phoenix, Arizona? Sorry, haven’t heard anything. Is that where you live? No. I am in Montpelier, Vermont, but I used to live near Phoenix and I went to college out there. I have been back here since 2002. Thanks. Amazing photos. Congrats on being Freshly Pressed! Great article. Folks like to forget that trains made the USA successful, and it boggles the mind that pro-green folks here in California aren’t demanding that folks utilize the train more… it is far less of an environmental impact than hauling trucks or commuting. In California we are running out of room for more major freeways and yet traffic is still horrible; we can’t build freeways upward because of our earthquakes. Voters approved high speed rail (and the funds for it) nearly a decade ago and yet they have yet to break ground. The main obstacle to improved trains and high-speed trains here is revenue, namely that which the state, federal and local governments make on every gallon of gasoline that is pumped in this state. It’s a daunting sum of money, for almost every resident over 18 here has and uses a gasoline-powered vehicle. Until that changes the only ‘green’ changes made here will be of a regulatory nature, which is another article in of itself. I support trains and more trains. Travelling by train makes sense in many ways, one being more responsible to the planet. As an Indian, Train is the way I move across my country. Since oil is not as expensive in the US as in India, travelling by cars appeals to the people. But it is the Americans who should demand that the country have a good rail network, as after 30 years, with no gasoline and Airlline fuel around, ultimately it would be the Electricity driven transport taking us around, and Aircraft doesn’t work on Electricity. All good points. Some of us already demand it very passionately, but I think we’re either not loud enough or large enough yet to have our voices heard by the people who ultimately make the decisions on taxation and large public works projects. I hope that changes before it’s too late to do anything about it. Everyone should try riding the trains in Europe. The major lines offer alot more destination choices and are efficient. We rode Germany’s Deustch Bahn, and combined it with cycling the bike routes. Also Czech Republic has their aging, but very clean fleet. They too offer bikes to be brought onboard and strapped from moving around. This was last year. For more pics, see http://thirdwavecyclingblog.wordpress.com Or my other blog. IIt’s a shame for a huge country like Canada, our train system is very thin. Bus system is not as fast. :)Love your post!! Ah the train….when I went to college in Atlanta, GA there was the Marta train but I never used it. The reason why is because It unfortunatly didn’t stretch out to certain areas beyond city limits and the same problem was with the city buses. Before going to Atlanta for 4 years I didn’t have a car and always used the Las Vegas bus system which worked great for me. But in Atlanta, I couldn’t get around without a car and I walked very less (especially at night). It’s really a shame that public transportation is really bad. A lot of people think that widening the roads will help make traffic move more swiftly but it just creates more bigger problems. Besides Europe and Asia whom have good public transportation, I can’t really think of any citys in the US besides the ones listed here who have good public transportation. Oh wait..there’s Oregon and as I mentioned above the Las Vegas bus line!! After reading this post, it reminded me of the book entitled “The Death and LIfe of Great American Cities” by Jane Jacobs. In it, Jacobs describes a concept of hers entitled a “sidewalk ballet” or the activity and movement that exists within a community’s sidewalk. The author expresses her interest in sidewalks because they essentially characterize a town or neighborhood. You see the people, where they go, what they’re like, etc. The last couple of paragraphs you wrote brought this connection, because ideally you are right. Train stations, subways, metros, any form of railway transportation reveals the life of a community, it gives them an identity. Thank you for your intriguing post! Also, if possible, I would greatly appreciate it if I could share my blog on this comment. It’s a brand new blog I just started entitled “Logic Meets Reason” (www.logicmeetsreason.wordpress.com). I invite you and any other readers to check it out, send a comment, and subscribe! Sounds like a book I should check out. Best luck with your blog! I have lived in England all my adult life, and have travelled extensively by train in the UK. I have also made train journeys in Europe. Last October my husband and I visited family in Rochester NY, and then took the Amtrak train to New York City. We were slightly shocked at how very late the train was – something like 2 hours! That sort of delay is virtually unheard of here, the sort of thing that might happen in severe weather, or as a result of an accident. We were told it is fairly common there. However, once the train arrived, the journey was very pleasant. We had booked a compartment, and coffee and meals were included in the ticket price. A member of staff loaded our luggage onto the train – how nice! The best part was arriving at Penn Station in NYC. We simply picked up our luggage, went up the escalator and got a cab to our hotel. Compared to the agony of waiting for luggage to be unloaded from the plane and then travel from the airport into Manhatten, the convenience of arrival more than made up for the delay in departure. Yes, sorry to say that’s not an unusual occurrence for Amtrak. Your point about making journeys highlights another part of the problem here: not nearly enough Americans travel abroad, so very few can get the kind of perspective you have and understand just how far behind our infrastructure has fallen. Excellent blog post and many good points! I don’t live in a large city, but a small town in the middle-or-nowhere in Illinois. However, when I need to get into Chicago, my first stop is Metra’s web site to check the schedules. I can go to one of the outlying stations, park for a couple of bucks, and take the train into down town for less than $20 round trip. Most of my friends think I’m crazy to “bother” with the commuter trains. I think they’re nuts to pay for the gas to fight the traffic to get into down town, then pay upwards of $30 for parking. Not all of Europe is that civilised; Britain’s trains are hideously expensive and usually late. Complain about Amtrak if you want but try 5 years of commuting into London first. I got a seat about twice a year! I rarely sat on the DC metro, and I pay through the nose for NJ Transit into NYC, which is often late by as much as 20-30 minutes. Think I can relate. Great Mix of photos ! cool post! Thanks for sharing! The US presents a tough case for rail, a lot of places just don’t have the density to support it. I think it would have made more sense to go all out on the California and Northeast Corridor plans, instead of spreading it around like peanut butter. We need proof cases to show what the benefits are. I think your point that spending for public transit is viewed by some as a form of socialism shows how much there is to do to bring the USA up-to-speed with the rest of the world. Here, the “public” realm has increasingly been conflated with services for the poor, when it could and should apply to everyone as citizens and members of communities. Many people avoid public transit because of this seeming stigma, and perhaps to avoid situations where they might have to interact with others who are in a lower income bracket. It ties in with some of the greater problems of social isolation and hyper-individualism that are reflected/perpetuated by our consumer-focused society. As with so much in trying to become sustainable, it is mostly a question of culture. Our perceived separateness is making it hard for people to understand that we’re all in this together. Without that experience of shared destination, people can cling to the belief that they can get by just by looking out for themselves. Congrats on a great post and Freshly Pressed status! I couldn’t agree more with your points about our individualism/isolation being a stumbling block, and that everything comes back to culture. I think we used to be that way, in the US. We used to sacrifice to do things that were big, difficult and worthwhile. Some days I wonder where that went. These are the main reasons why I’m so interested in what happens in East Asia. There’s something to be said for combining recognition of individual merit with collectivism. Great post! Around here we’re stuck with buses. They run fairly well and they keep schedule pretty well. But they want to bring streetcars back to the city. And of course they want to connect Brown University to the South Side where the hospital complex is. But the thing is, I said drop a line from downtown out to Johnston. You’ll find that a busier line and you could eliminate two bus lines in the process. It’s still up in the air whether the first line will be built or not. But I want track everywhere! One of the idiotic things mentioned at a hearing I attended was that the distances in RI were too short to warrant light rail. Um, Providence to Warwick on the border of East Greenwich is 12 miles. Go a few more miles and you could connect right to the University of Rhode Island. Just do one line from Pawtucket on down and you’ll see people use it. Thanks! Sounds like you are on the front lines trying to make things happen. Do you work for a planning/development organization, or just a concerned citizen? The trains I use to go and visit my grandparents on as a kid from Chicago to Michigan are sadly no more, even at 14 I could go alone and they would meet me at the station, and i would be perfectly safe. I once went from to Chicago to New York on a train and felt I was on that train forever. Great post. Thanks Cathleen! I envy that you had the opportunity to use those trains while growing up. I was brought up in rural PA and NJ, where we had to get in the car and drive 10 minutes to pick up a gallon of milk. I didn’t discover how great rail links were for mobility until I was out on my own and moved to cities. I would like to write a post about the Train Culture post and your blog generally. 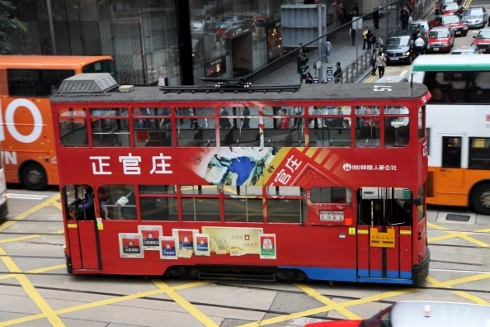 May I use some of your Hong Kong tram photos and mug shot? 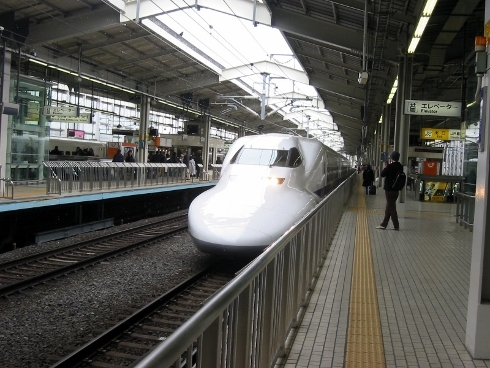 As for the Shinkansen, they’re certainly convenient… for anybody that can afford them. They are NOT cheap. At all. In fact, they are very, very expensive. Travelling around Japan is one of the most expensive things about living here. Holiday-makers to the country can get the ‘Japan Rail Pass’, and that makes things a lot cheaper, but for those who live here, it costs about the same as flying a lot of the time. And you can’t get any cheap flights either. There are no cheap anythings when it comes to travel. A trip to Osaka (which is not very far, really) on the Shinkansen costs 15,000 yen. 30,000 return trip? No thanks, I’ll take the bus or hitch-hike. Hey, thanks for weighing in. Your perspective as a Tokyo resident is more than valuable. I missed my own share of last trains! One upshot is that you might almost be sober by the time you walk home. I hadn’t meant to imply that Shinkansen were cheap. As you point out, the non-gaijin on holiday price is on par with air travel. Given comparable pricing, I’d much rather take the train to take advantage of the comfort and relative lack of hassle associated with air. With regard to pricing in general, at some point governments need to have the conversation about which modes of transport are more desirable/sustainable than others. Ideally, a carbon tax or cap-and–trade scheme would penalize those that are carbon intensive (planes and cars), thus making the lower intensity modes (trains, etc.) more cost competitive. No one problem can be solved in isolation. 15k yen seems quite fair, eurostar costs about 100 eur for comparable distance, it’s faster and more comfortable than airlines, let alone lowcosts..
sorry for my english :) great post! Thanks for commenting! I wish more people here would at least have the chance to experience what you had as a child. I loved the light-rail system in Frankfurt. I scratch my head when so many people can decide that “car utopia” is the preferred mode of mobility without having anything else with which to compare it. great post! I live in Boston and the train system saves my life…Boston to Rockport for under $4 with my bike…I think it’s time to call socialism “commonconsensualism”….Peace! Well,you could take a ride in indian trains,they arent fast,comfy or sophisticated but they give you the feel of bieng back in time like during the advent of train. In Melbourne in Australia, the train is a fundamental means of getting to the city. Parking costs in the inner metropolitan areas are very high otherwise. Public transport is big here: we have the tram network, bus network and train network for which you just need to buy one ticket. There is also a free tram for the tourists in the city and a free shuttle bus. Plenty of people still use cars but there are busy city roads which ban cars from using them during certain time frames so cycling is popular too. There are bike stations from where you can borrow them temporarily. I suppose the fact that petrol is not so cheap makes the decision to board the train easier. Great piece. My best memory of taking a train was last time I was in India. We had to sprint to get on. When I was sure I was the last one to make it I turned around and saw about 25 others catch on. Then, a local fell asleep on my shoulder…he was wearing a Chicago Bulls hat..quite the juxtaposition! Saying that trains are a path to socialism is one the most ignorant stuff I have heard. I support high-speed development in the U.S.; it is attainable. Japan has great train infrastructure. Although North America is less densly populated, we can make trains work here. In the Pacific Northwest and in the Northeast, trains are popular. It’s good to hear articles such as this. I am working on a post on trains presently and I am inspired by this one! Thanks. Quite personal yet comprehensive. Great going! Love your train post and congratulations on being FP. We moan a lot about our trains in Britain, but at least they are still an option. You have to be organised and book in advance unless you’re prepared to pay a lot though. We never had a car when I was growing up because we didn’t need one. Public transport (including the local train network) was subsidised by the council as something for the public good that enabled the city to thrive. What happened to the idea of civic/state pride? I went the length and breadth of Britain and a few circuits of Europe on trains and have some great memories. My kids have not grown up with that independence because out in the sticks it’s too expensive now to use every day. Their sense of growing up revolves entirely round getting a car. Talking of independence, and getting back to your idea from Japan of a station as a hub of the community – how do the elderly cope in the States when they can’t drive any more? Is there a lobby there waiting to be activated? Finally for anyone who likes trains and is in/visiting Britain, we have lots of volunteer groups running old diesel and steam trains on short parts of the rail network that got shut in the ’60s – I know it feels a bit like zoos for railway engines rather than functioning transport, but they are still great fun to visit and some also offer occasional “driver days” where you get a go on the footplate. Great article! i like your blog. I love backpacking, and when I do, I’m completely reliant on public transport. Each and every experience is one to never forget, but I especially cherish my first Shinkansen ride and my cross-country tour by bus and train in Thailand. As a student in the Netherlands, I don’t have to pay fares for public transport. I simply love to hop on a random train on a free day, and just see where I end up. A great way to find new awesome places and new friends. Love this post! Heard that the rail stimulus may be one of the things to be cut in a couple of the deficit reduction proposals. This would not be a good thing for a number of places including the northeast where I live and communte by T everyday. As a London-based train user, I can tell you that I do love getting the train. It is unfortunate that the UK train network suffered in the 1960s amidst the “Beeching Axe”, when almost one-third of the network – targeting the least used – was shut down. The goal of this, as you might expect, was cost savings. Alas, the cost savings failed to materialise when it turned out when – after the action had been taken! – it turned out these apparently “little-used” lines acted as “feeder” lines into the trunk network. Bit too late by then, though. Even now in the UK, following the privatisation of the network, we’ve had over a decade of above inflation-rate ticket price increases (with no sign of abating), even though the government subsidy is higher than ever. And I think we have the highest ticket prices in the world too. But – to count one’s blessings! – at least the UK does still have a largely reasonable train service, for all our gripes… :-) Totally agree with the author that to read a book or watch the scenery is a nicer, greener, cleaner option than driving. What I love about the Japanese train system… the arrivals/departures are so incredibly accurate that I remember seeing commuters with their phone alarm ringing, then they proceed to get up and walk to the exit knowing that say at 7.54am, they’ll arrive at their station, on time, every day. So amazing. I have been in love with trains since I was little. My grandfather used to take me on the EL – The elevated train through Phillidephia. Great memories jumping from train to train way up above the city streets. What a rush. I will never forget those times. Great blog. Keep it going! I used to take the Blue Line to work in Center City when I lived near Penn. Love the photos. My dream life often takes place on trains. I sometimes get the train from Marseille to Hyeres in the south of France, where I live. It is such a relaxing journey and the contrasts of industrial sites, building work, graffiti, mixed with blue seas and green pine forests every now and again, passing by, not too fast (not like the TGV which whips!) it just seems to blend the many faces of southern France together in one hour or so journey… a great, short train journey. Last week I took Spain’s new high speed AVE train from Madrid to Valencia. It was fast (200 mph), smooth and on time. We passed through rolling hills, vineyards and fruit orchards. It was a great way to travel. I love traveling on trains. We took one from Rome to Venice and it was such a great experience. I love watching the scenery change and the view of Tuscany was so beautiful. I need to travel on trains more. Thanks for posting! Congratulations on being freshly pressed! I now live in Melbourne, Australia, with its wonderful network of suburban trains and trams. (The trams are a bit slow but are wonderfully picturesque). I grew up near Nashua, New Hampshire, however, and remember my father catching a train to work from a station in downtown Nashua. Passenger service to southern New Hampshire disappeared many years ago, and a new station planned in the late 90s (?) for south Nashua never eventuated. There is talk about extending the Amtrak regional to NH, but if it ever happens, it’s a long way off. And how good would a high speed train between Boston and Montreal be? BTW, Taiwan has a first rate metro system in Taipei, and an extensiive regional and VHS train network. This made me want to go down to Shibuya station and walking with the crowds towards the Starbucks for a coffee to watch the masses move below from the shop’s windows. Too bad I’m in Dallas. :- I love trains. I used to hang out in Shibuya a lot! I totally agree with VGAG. A train from Montreal to Boston would completely rock! What a great idea. Lets build it! You have a cool blog. wow! I love that. We, Indonesian, dream to have the good transportation, especially train culture like that. Now in Jakarta, the capital of Indonesia, we’re in problem with the new system of train. I live in London and the tube network is brilliant, its a shame that a half intelligent person cant get a job on the old boy network, now run by the elitist’s drones , in the form of those with IQ’s lower than ninety. God help you if you are actually a national citizen when applying for a job. Otherwise good service. I love train travel – so much more civilised than driving or flying these days. In London, where I live, we’ve got the Underground. This is a weird example of a mass-transit system that’s so old and rambling that it’s actually become part of the city’s culture – the roundel logo has been adapted as an emblem for the entire city. Only had time for a quick scan but looks like a great article and similar to the UK. Will have a good read later. Great and entertaining post and blog!! I love trains! I really enjoyed this post. I’m from Nashville, TN, and of course, the south isn’t exactly known for its forward thinking on issues like public transportation. We have a commuter train that began a couple of years ago called the Music City Star which runs only rush-hour routes along the east corrider from Lebanon (a town about 30 miles out) to downtown Nashville. It has had modest success. The fact that it is stll running is a success in and of itself around here. I have often contended that in areas of the country without the population density to support train travel like the Northeast does, it would be wise to start a rail program with the idea of supplementing air travel more than getting people around a city. If there were non-stop trains between cities like Nashville, Memphis, Atlanta, Louisville, Birmingham, etc., I think the ridership would be there. Unfortunately, anything other than “a pickup truck in every garage” doesn’t fly very far in these parts. Great post. I’m always taking the train in Japan. Since I don’t have a car, trains and train stations are very important for transportation and focal points for me. I like to explore neighbourhoods around the stations, and they all have their own unique atmosphere. I love it! Thanks! I love your blog too. Actually, quite envious that you have had so much opportunity to explore Japan :) My hope is to find a way to channel my professional work so that I have the need to travel or relocate there. Thanks! So you want to be able to spend a lot of time in Japan? It definitely is a great place. I’ve been here more than 6 years, and I’m still loving it. Medium-term, plan to transition from US to China-based. Once there, it will be a bit easier to make periodic trips to Japan. Ultimately would like to live in Japan for at least a few years, maybe longer. i enjoyed this blog really. What a good post. I live in Germany (it has to be the train travel Mecca?) and after a year here it has just become a way of life for us. I agree with you whole heartedly, there is such a thing as train culture. it is hard to define but it leaves an impression. I think the announcement “Ausstieg in fahrtrichtung links” will ring in my head for the rest of my life ;). Sounds great! Now I’m thinking a new question is: if “train culture” exists, does it share common features from place to place, or is each it’s own flavor? It is fun to see someone write about something most people take for granted and rarely even regard with the exception of delays and such. 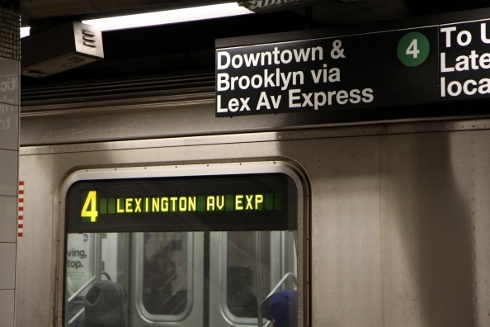 I myself work in the tube (subway) I drive the train 6 hours every day and I’ve never once grown tired of it. The subtle rocking of the train, the slow and gentle jolt as the train starts rolling, and the low hiss of air as I let go of the security grip of the train. That’s what I like about the subway and trains and I agree with you that there is a train culture, and quite a rooted one as well. I have loads of people asking me questions about the trains, how they work, the tracks, the signal system, they take pictures etc etc. Thanks! And thank you for proudly working to make life simpler and better for everyone, though we may not appreciate it nearly as much as we should. That’s a very generous offer. We’ll look you up if we make it there :) I’m guessing you’re in Stockholm? Since I just moved from California to New York, I just now got to experience the “train culture”. I love it. I have no idea why anyone would dislike the trains…they get you to and from your destination while you nap, read, listen to music or amuse yourself with the other passengers. Trains will forever have a warm place in my heart. Absolutely loved this! I’m travelling through China this summer and I’m excited and nervous about using the trains. I don’t suppose you have any advice about the sleeper trains? Hey, have a good time! I haven’t traveled that far by train in China yet, so can’t speak from my own experience. My wife recommends not shelling out extra money for the soft sleeper. It’s not “that” much more comfortable than the hard sleeper, but quite expensive. Only worth it if you were taking a several days trip, perhaps. train in my country not succesful.. It very slow. I have social bookmarks in http://www.beritabaris.com, if you don’t busy,you can visit my web. Just finished blog post about your train culture post. Any thoughts, critiques, would be appreciated. I look forward to following your blog. I’ve never ridden in a train…. This is a great post! Here in Portland, OR, I think the train culture is, if not the dominant culture over single occupancy autos, then at least the 2nd place culture. One of Portland’s big claims to fame is our light rail system, and over the last 25 years it has been so ingrained in Portland’s culture that it’s really one of our most defining characteristics now. We do have an expansive bus system too, but it’s our rail that makes the news. I’d started blogging about light rail here in March of last year after seeing so many of the same questions about it coming up when I talked to people on the trains (how fast do the trains go, what do these signals mean, what does this sign tell you, etc) and it’s been really great to see the interest people have in light rail – especially youth. One of my blog readers is a high schooler who is nearly finished building an accurate representation of our entire light rail system, and I think that’s a great thing for someone his age to be interested in. I always like it when I get people, especially teens and children, asking things about the trains, because that makes me hopeful that they’ll grow up with an interest in forms of transportation other than cars. I think another thing here is that a monthly pass (unlimited rides) for youth/students is $26, so they’re really encouraged to get around via trains and buses and they have that kind of mobility without needing to depend on parents for rides or having to purchase and maintain a car of their own. I’m not sure any longitudinal studies have been done on Portland youth who grew up with the trains as an ever-present part of their life and how that impacts their view of cars, transit, etc now, but it would certainly be interesting to see. I am a train lover. I see one and I start planning a journey. In fact, my travel blog has a train on the homepage, my friend in all travels. Since you do enjoy these journeys, come to India. Train travel here is completely different! I live in Jakarta, as you write, my neighbors have to leave at 5 am for work and return at 8 pm. Congestion has spent all the resources; gasoline, time, energy, comfort and family time. Jakarta does not have a train culture. We can only hope that one day we have a comfortable train. Well researched and I love the supporting pictures! Nice article. Along the eastern side of the country trains might be better equipped with passenger routes than they are east to west. A person wanting to travel from New Jersey to LA would probably be better off hopping a freight. Agreed! Rail only makes sense where there is density to support it. Well you missed the Mumbai Suburban Railway which began services in Mumbai in 1867, transport 6.3 million passengers daily and has the highest passenger density in the world. The next is the Kolkata Suburban Railway, the first rapid transit system in India started functioning in 1854. By the way, the article was very interesting! Hi Subhadip- Thanks for your comment. Though I have traveled in India and countries in Europe, I focus primarily on the US and East Asia, those are areas where I have lived and feel most equipped to talk about. 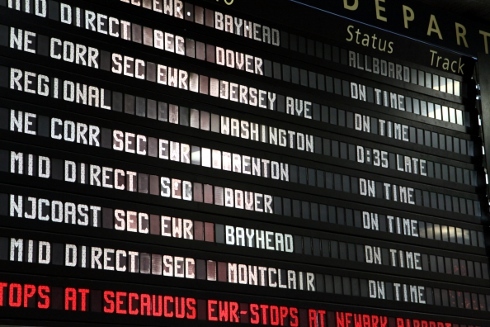 The Northeast Corridor arrival board photo brought back memories (of sitting around waiting…and waiting). This country may seem to be anti-train but part of that may be that it’s such a large country with so many unique destinations. People might figure its easier to just drive direct rather than take a train and end up having to drive the final segments anyway. Who knows!